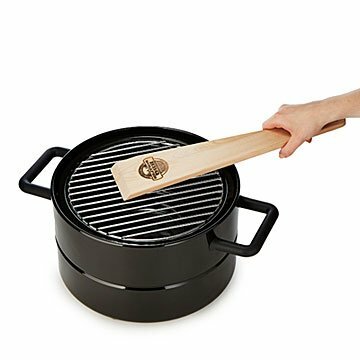 Cleverly cut at a narrow angle, allowing the hot grill to burn perfectly sized grooves into the wood. A craftsman knows how to care for his tools. And if your masterpiece is something mouthwatering and hot off the grill, this BBQ scraper should be an essential part of your toolkit. It's made from solid birch, which means it's strong but also won't scratch a metal or porcelain surface like a wire brush can. The working end of the scraper is cleverly cut at a very narrow angle, allowing the hot grill to burn perfectly sized grooves into the wood. The long handle keeps your hands away from the heat, and gives you room to comfortably use both hands when needed. A low maintenance tool, this scraper should keep your grill in peak condition for years to come. Handmade in Canada by local woodworkers. To clean, turn the scraper over and rub against the grill to remove any charred bits. When dry, help condition and preserve your scraper with mineral oil.